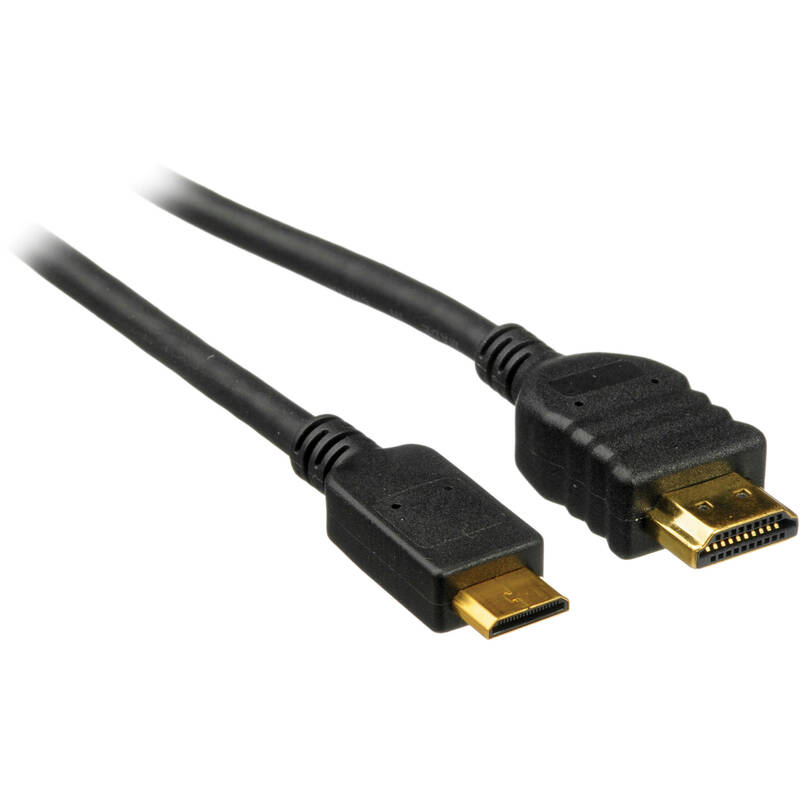 Box Dimensions (LxWxH) 9.3 x 2.65 x 1.9"
6' HDMI Male to Mini HDMI Male Cable (Ver. 1.3) is rated 4.7 out of 5 by 56. Rated 2 out of 5 by Beantown Sun from Overpriced! Just a standard HDMI Cable It is just a standard regular HDMI cable. It came with a Canon box but the cable itself didn't say it was made by Canon. It could be a cheap one that costs less than $10 but because now it is in a Canon box it costs you $48.79! I bought it only because I expected the cable should have Canon marked on it but nothing. I use it to connect my camera to Ninja 2. Rated 3 out of 5 by PP from Must have if you want to watch HD videos I bought this cable to connect my Canon Vixia HF-200 to my home theater system. This looks like a pretty standard HDMI to HDMI mini cable. In my opinion this is a must-have if you want to watch your full-HD videos on a TV during a trip without having to process them first on your computer. It is a first class product but I think you could go by with a thir-party (and cheaper) cable or, better yet, with a standard HDMI cable and a HCMI x HDMI mini adapter (less things to travel with as I already take a standard HDMI cable to connect my Mac). Rated 5 out of 5 by Joe the Limper from You get what you pay for Initially I purchased the (much) cheaper 'generic' cable for my new 50D. It worked well enough, but was bulkier than a transatlantic cable. I knuckled under and paid the big bucks for the dedicated Canon HDMI cable and now have a permanent (bulky) cable in place behind the TV (very convenient) and a more elegant cable in the camera bag for use in other locations. Rated 5 out of 5 by Anonymous from Highly recommended for Canon DSLR camera I am very pleased with this cable for connecting my Canon DSLR camera to any HDTV. Easy to use and the cable is long enough to reach a wall-mounted TV.Excellent visual and audio quality. It is worth paying a little more to get a genuine Canon HDMI cable like this one. I can now watch photos and video clips taken with my camera on the big HDTV screen. Rated 4 out of 5 by MilosPhotos from works but could have better fit I purchased it so that I can review images and HD video taken with my Canon SLR's (5DII and 1D Mark IV) on my HD television. Works great, images look wondeful. The fit between the cord and HDMI slot on the TV could be tighter but has not caused a problem. Not sure if it is the fault of the TV (Visio) or the cord. Rated 5 out of 5 by VEDesigner from Authentic CANON product After reading several reviews of knock-off products (priced significantly lower than this) I decided to go with the real thing. Costs more, but this cable works flawlessly, came in CANON factory-sealed packaging and is exactly as advertised. You cannot ask for more! Rated 3 out of 5 by Steve from Worked on Canon 5D Mark II I bought this to monitor my Canon 5D Mark II on a TV monitor or TV set. It works. Not much else I can say. HDMI cables are overly expensive in my opinion. For onboard applications I'd want a MUCH shorter cable. This is better for use showing friends your shots on a big consumer TV, since the cable is fairly long. But if you wanted to monitor the 5D to a field HD monitor, this cable would get in the way. Rated 3 out of 5 by Brent from Pricey but needed So you may be asking yourself why would anyone pay this much for an HDMI cable? The only reason I can give you is that you need this Canon-specific cable to fit in their cable port protector and clamp for the 1DX/1DC. I tried several others and none of them fit, so I was forced to spend a ridiculous amount of money on this cable. It works fine, but is super overpriced. Can I use this cable to connect my Rebel T5i to an external monitor? If you have a monitor with HDMI connectivity, yes. I use the connector to a home theater system. All I have to do is connect the camera to the receiver HDMI slot, change the input channel of the theater system, and viola my T5i viewfinder is visible on the TV. Totally hassle free. It also works with a direct HDMI connection to the TV itself. Image playback is just as easy as using the playback controls on the camera body. can i use it for a canon rebel t5?